So, where did all the zeros come from? Zero came from 5 multiplied by any even number factor. For example, in , if we multiply and , this will give us 30, a number with one trailing zero. Notice that none of the remaining numbers in the multiplication can add another trailing zero. Example 2: How many zeros are there in ? is equal to some number with two trailing zeros because we have a 10 and a 5. If you check your answer, . As you have guessed, the product will have 3 trailing zeroes because the factors contain , , and . Notice that three of them are multiples of 5. Ten is equal to 5(2), and the two numbers multiplied by any even number can also give a trailing . Since there are more even numbers than the multiples of , we are sure that every multiple of 5 can be paired with an even number. Therefore, we can say that if you want to know the numbers of n!, just divide it by 5. For example, how many 0s are there in 22!. There are 4 multiples of 5 less than 22 (20, 15, 10, and 5), so we know that 22! has four trailing zeroes! 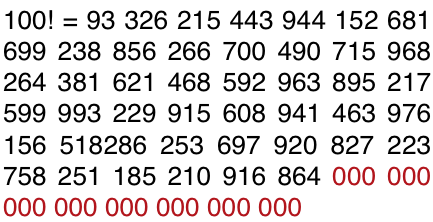 Or simply, what is the integer quotient (Can you see why?) of ? If we divide by , the answer is . Now, what is the reason why was divided by in the solution above? In 100!, we have factors that are multiples of . If we divide them by , we get , still multiples of 5. This means that we still have four that needs an even pair, so we need to divide again by . Now, since we have already counted the 5’s in the first division, we need to count the second set of 5’s. Instead of dividing again by , we divide them by . That is the reason why we also divide 100 by . So, in general, how many zeros are there in n factorial?